If you’ve ever been troubled by what they call a ‘postmodern moment’ – disorientated, disconnected and detached – worry no more, write Monika Parrinder + Colin Davies. Postmodernism is over, according to Nicholas Bourriaud the French writer and curator behind the current Tate Triennial 2009. Instead, the altermodern is emerging. This rejection of postmodernism (after modernism) is a rejection of ‘history as an arrow’, as Bourriaud put it in a recent Tate interview. 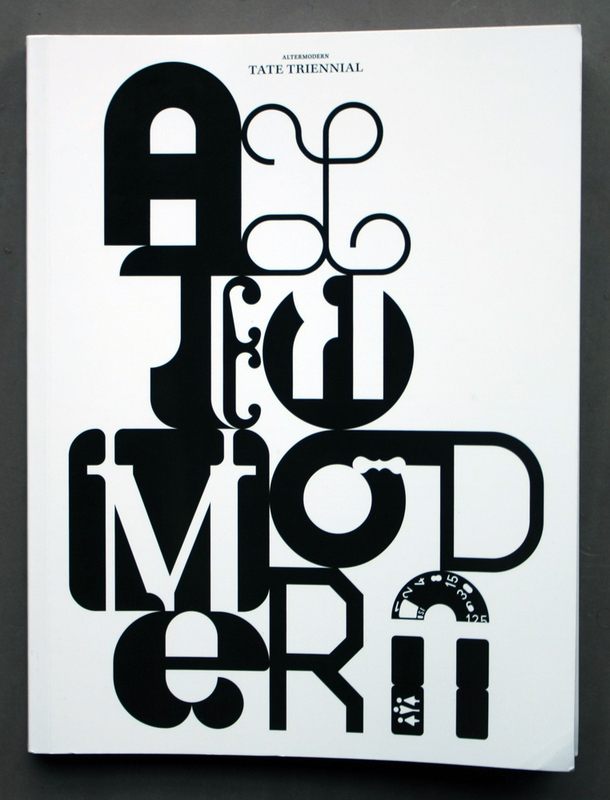 Alter proposes ‘multiplicity, otherness.’ It’s the ‘re-loading’ of modernism for today’s context; global, nomadic, creolised but – crucially – connected. ‘Today we are living in a maze and we have to get meaning out of this maze and these are the big stakes around the altermodern,’ he claims. Meaning is back in fashion! 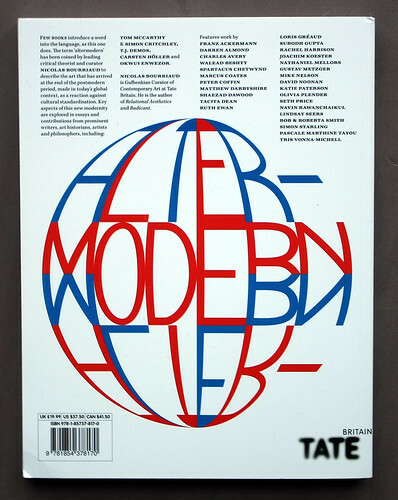 Altermodern runs until April 2009 at Tate Britain, based on four themes – ‘alter’, ‘exile’, ‘travelling’ and ‘borders’ –, which provide cluster points for Bourriaud’s Altermodern manifesto. Bourriaud’s interest is in how artists can meaningfully connect across moments. A significance for designers is that this matrix of relationships – between people, contexts and medias – is one in which design was already embedded, long before the Bourriaud sound-bite machine came along. What then, can design gain by ‘reloading’ the latest art criticism? A link here is M/M (Paris), the designers Bourriaud insisted be used for the show. M/M (Paris) have worked with him since he was director of the Palais de Tokyo in Paris, where he developed the curatorial practices that informed his first book ‘Relational Aesthetics’ (1998). This explored art which creates ‘scenarios’ and generates relationships between people. It was followed by ‘Postproduction’ (2002) which relocated – reconnected – the relational into the Internet age. In ‘Part of the Process’ (Eye no. 59 vol. 15) we used this work to discuss what’s already going on in design, with reference to work by Ji Lee, Kenya Hara, Daniel Eatock and A2. M/M (Paris) provide a good example: their design often functions as co-ordinates, points at which the art, design and fashion communities meet. For them, the moment of intersection – of people, contexts, medias – is like a conversation which becomes the ‘engine’ to produce images. The ‘solo’ show by M/M (Paris) in London (Haunch of Venison, 2006) was an installation-collage of preceding work. Uprooted from its original context, some of their visually baroque, story-building work lost its original meaning. In a parallel talk at Tate Modern they explained that to re-edit old images to ‘create a new history’ was a deliberate process. This is the sense of creole that connects them to altermodern – which is time, not site-specific. Modernism 2.0? Graphic designers often view ‘theory’ as suspect. By the time art-cultural ideas such as Bourriaud's begin to resonate in design, their moments have passed in the art world. And yet, Bourriaud’s starting question –how do we make sense of cultural chaos? – remains valid. If the art world looks to the way artists answer his questions, then the design world should ask the same of designers, too. This year’s Tate Triennial will show how the design by M/M (Paris) – re-embedded in the ‘real’ networks of the show’s production – helps Bourriaud bring meaning to this chaos. 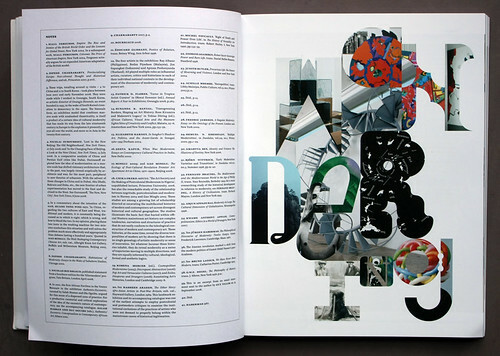 By Monika Parrinder + Colin Davies, Limited Language. Tate Triennial 2009 / www.altermodern.com. There’s a curator’s talk by Lizzie Carey-Thomas on 20 Feb 2009. Limited Language blog on M/M (Paris) as Bourriaud’s ‘semionauts’. 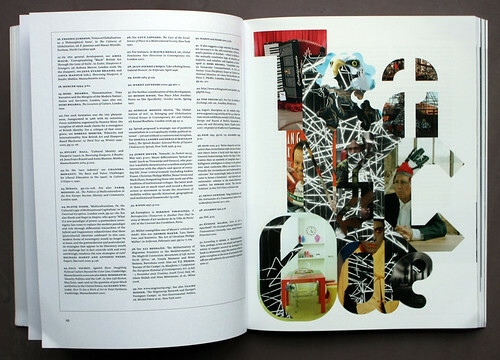 Above and below: Front and back covers and spreads from Altermodern (Tate Publishing, 2009, £19.99). Design: M/M Paris.